Photo ©: Landsat. Lake Chad and its drainage basin. CHADRILL aims to recover a sedimentary core spanning the Miocene-Pleistocene sediment succession of Lake Chad through deep drilling. This record will provide significant insights into the modulation of orbitally forced changes in North African hydroclimate under different climate boundary conditions such as high CO2 and absence of N-Hemisphere ice sheets. These investigations will also help unravel both the age and the origin of the lake and its current desert surrounding. The LCB is very rich in early hominid fossils (Australopithecus bahrelghazali; Sahelanthropus tchadensis) of Late Miocene age. Thus, retrieving a sediment core from this basin will provide the most continuous climatic and environmental record with which to compare hominid migration(s) across northern Africa and has major implications for understanding human evolution. 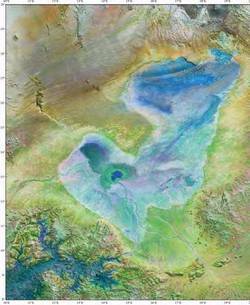 Furthermore, due to its dramatic and episodically changing water levels, Lake Chad’s sediments resemble maybe an analogue for lake systems that were once present on Mars. Consequently the study of the subsurface biosphere contained in these sediments has the potential to shed light on early life on Earth and other planets.